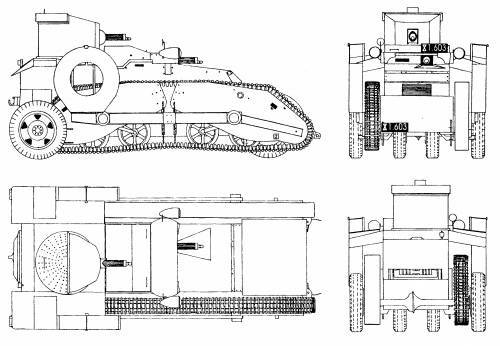 The Schofield Tank, officially either the Light Tank, Wheel-and-Track for both models, the Schofield Tank Type I and Type II, or simply the Schofield Tank, saw two versions of itself built and designed in 1940 (Type I or 1st prototype) and 1942 (Type II or 2nd prototype). It's origins lie in the mind of E.J. Schofield who at the time of designing the tank worked at General Motors in Wellington, capital of New Zealand. At the time of 1940 the Japanese Empire had established complete dominance over the Pacific Ocean with the French fleets having been scattered with the surrender of France and the British fleet being busy in Europe trying to blockade the Baltic sea and deal with the U-Boat fleet of the Germans. A fear of a Japanese invasion also swept through Australia and New Zealand with the United Kingdom unable to send much supplies, especially tanks, to either country. As such a team lead by E.J. Schofield designed and built the tank, the Type I, before presenting it to the New Zealand government. Both models of the vehicle were based off of the chassis of the Chevrolet/General Motors 6 hundredweight truck and used the same suspension from the Universal Carrier. Like the Soviet BT series both designs also had the capability to run with both tracks on and tracks off. The first design was designed by E.J. Schofield and his team in 1940 and presented to the government in the same year with the model being made by the end of August, 1940. The first prototype with its tracks up and wheels down, notice the turret is facing backwards. All sides, excluding the bottom, of the first prototype. The design of the first prototype was a long but low tank reminiscent of a truck being able to be seen in its cab-like design. A cylinder turret is seen in the very rear of the vehicle with (I am guessing) the engine located in the front. The turret itself contains a single 7.7mm Vickers machine gun with another one located just beside the driver in the front of the tank. It has a total of three crewmembers, the driver and a machine gunner in the front with a second machine gunner in the rear in the turret. It's armour is never officially stated anywhere but since there is no change listed anywhere of the armour being thickened, or thinned, between the two models it is safe to assume that it is 6mm to 10mm thick like in the 2nd model. The second design was designed by an unknown member of the original team led by Schofield sometime between 1940 to 1942 when the model was constructed. In 1943 this model was sent to the United Kingdom for evaluation at which point they advised them to stop working on the vehicle. This was probably due to the fact that by 1942 the American fleets had broken the Japanese dominance in the Pacific and allowed for both British and American tanks to finally arrive in Australia and New Zealand. It is unknown what happened to the models of both the Type I and Type II prototypes but it was likely that they were scrapped at the end of the war. The second prototype with its tracks up and its wheels down. 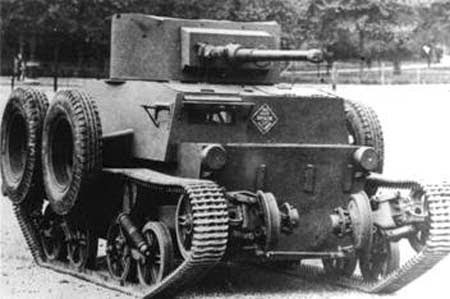 The second prototype from the front and top, note the open turret. The second prototype from all sides. 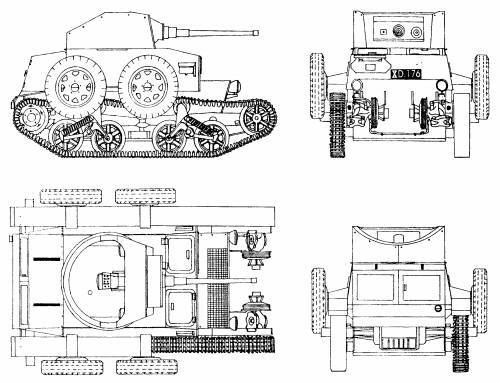 The design of the second prototype is very similar to first but saw itself shortened by 0.2 meters, the design becoming more boxy and more like that of a truck, it's with increased by 0.5 meters, and the old turret replaced by larger and longer but open-top turret. The engine was likely moved to the rear of the vehicle with the turret being moved from the rear to the center of the tank. It's armament was also changed with the Vicker machine guns removed and replaced by an Ordnance 2-pounder tank gun and a 7.92mm BESA machine gun of which both were placed inside of the new turret. Like the first prototype it also has three crewmembers, the driver and commander (who also likely served as the loader) in the hull of the tank with the gunner in the turret. It's armour is thin with it ranging from 6mm to 11mm (but Wikipedia labels the maximum as 10mm). Where would this go in the game? The first prototype most likely wouldn't make it into the game due to its lackluster armament (unless someone finds a high-penetrating round for the Vickers on par with the .50 cal of the M2A2). However, the second prototype would prove useful. It's thin armour would prove a challenge as vehicles that would normally not be dangerous, the M13, T17, and other .50 cal armed vehicles could easily kill you with the other threat being planes. It is a very quick vehicle though and its armament is enough to do some damage. This would probably fit as a reserve vehicle or at 1.0 and at most 1.3. Bletch - why would you bother, apart from comedy value? It's a neat little tank that would be fun to drive. It would probably fit best as a 1.0 premium too since it is a prototype. I think it would be bloody awful to drive - it has sweet f-a power - less than 1/2 the amount of a universal carrier with twice the weight, all on a U/C's small tracks - IMO the published figures for speed are (cough) optimistic - probably going downhill!! Well, unless I manage to find the records from the testing of the second prototype we won't know. we know that it had half as much power with twice as much weight - that's not a matter for dispute, and those factors would have to be taken into account if (heaven forbid) someone wasted developer time putting it into the game! you know what, i'm for it at 1.0 premium and 250 GE. a tank made by the people who created the biggest laugh of a joke tank ever. 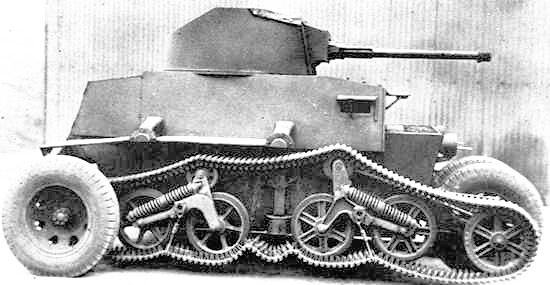 completely redundant but it would give gaijin a reason to use the suspension controls to make a track/wheeled tank work. Hell yes. As a 250 GE premium or a first-level Operation Summer gift tank, this would be a great 1.0 light tank. It’s kind of a novelty Tetrarch, which fits pretty well with the other 1.0 British premium being an A13.